Faith, Hope and Art: What triggers a "relapse?" I hope there are a lot of you out in blog land that have no idea what this picture is or means. But in our house, it's part of life. It follows my.. "I need some pee." So Maddie or on occasion a different child goes and pees in a Dixie cup and sets it on the counter for me. 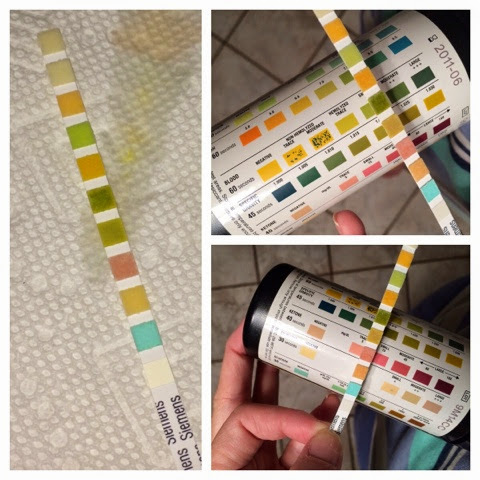 Tonight's reading shows that Maddie is spilling ketones, blood and protein in her urine. All of this from a stomach bug. Lexi had the bug too. They both started feeling bad Monday after school but Lexi was better by Tuesday afternoon and fine today. Maddie hasn't thrown up since 10am Tuesday morning and still can't get out of bed. You just never know what us going to throw her into a relapse. I am really hoping that she feels stronger tomorrow. Her first colorguard/band competition is Saturday. When we were talking about it tonight, in her normal stoic way, she sighed and said she wants to be able to go, but if she can't, it's not the end of the world. But I'm the one that's supposed to have to say things like that and reassure her. I'm mad that her body has robbed her of a carefree child-like approach to life.